The protein Ser/Thr phosphatases PP1, PP2A, and PP2B of the PPP family, together with PP2C of the PPM family, account for the majority of the protein serine/threonine phosphatase activity in vivo. While PP1, PP2A, and PP2B share a common catalytic domain of 280 residues, these enzymes are divergent within their noncatalytic N and C termini and are distinguished by their associated regulatory subunits to form a diverse variety of holoenzymes. Major members of the PPP family are encoded by numerous isoforms that share a high degree of sequence similarity, especially within their catalytic domains. Greater sequence diversity occurs within the extreme N and C termini of the proteins. Although these isoforms have similar substrate specificities and interact with the same regulatory subunits in vitro, the phenotype of a functional loss is isoform specific, indicating they perform distinct functions in vivo. 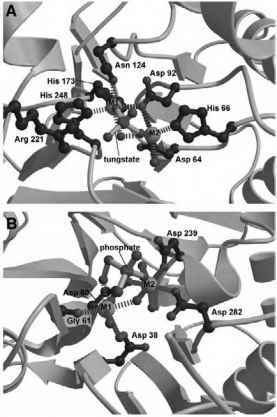 Figure 2 Comparison of the catalytic sites of the protein Ser/Thr phosphatases, showing the common binuclear metal center, coordinating the phosphate of the phosphorylated protein substrate: (A) human PP1y (for clarity Arg 96 is not shown) and (B) human PP2Ca. hydrogen peroxide and perhaps analogous to a possible PP2C regulatory mechanism, discussed later . The structure of PP1c with tungstate and PP2B with phosphate indicated that two oxygen atoms of the oxyanion-substrate coordinate the metal ions (Fig. 2A) [4,7]. Two water molecules, one of which is a metal-bridging water molecule, contribute to the octahedral hexa-coordination of the metal ions. The metal coordinating residues (aspartates, histidines, and asparagines) are invariant among all PPP family members. These residues, together with Arg and His residues that interact with the phosphate group of the phosphorylated residue, occur within five conserved sequence motifs found in other enzymes, including the purple acid phosphatase, whose common function is to catalyze phosphoryl transfer reactions to water . These observations suggest that PPP and purple acid phosphatases evolved by divergent evolution from an ancestral metallophosphoesterase. Consistent with roles in catalysis, mutation of these residues either eliminates or profoundly reduces catalytic activity. PPPs catalyze dephosphorylation in a single step with a metal-activated water molecule or hydroxide ion. The most convincing evidence for this notion is that the purple acid phosphatase, which is generally related in structure to the PPPs at both the tertiary level and at the catalytic site , promote dephosphorylation with inversion of configuration of the oxygen geometry of the phosphate ion . This indicates that a phosphoryl-enzyme intermediate would not occur. The two metal-bound water molecules are within van der Waals distance of the phosphorous atom of the phosphate bound to the catalytic site, and one of them is likely to be metal-activated nucleophile. PP1 and PP2A are responsible for regulating diverse cellular functions by dephosphorylating multiple and varied protein substrates. This seemingly paradoxical situation was resolved by the discovery that distinct forms of PP1 and PP2A holoenzymes occur in vivo, where essentially the same catalytic subunit is complexed to different targeting and regulatory subunits. For PP1 it has been shown that targeting subunits confer substrate specificity by directing particular PP1 holoenzymes to a subcellular location and by enhancing or suppressing activity toward different substrates. The control of PP1 holoenzyme structure and activity by the combinatorial selection of different targeting/regulatory subunits has recently been the subject of numerous reviews [15,16] and will not be discussed at length here, although the contrasting structural mechanism by which the conserved PP1 and PP2A catalytic subunits are able to form diverse holoenzyme structures will be discussed. In the case of PP1, it is known that the binding of targeting subunits to its catalytic subunit is mutually exclusive, suggesting that there are one or more common or overlapping binding sites, recognized by all PP1-binding subunits. It is therefore a little surprising that PP1-binding subunits are highly diverse structurally and share little to no overall sequence similarities. The key to understanding this paradox came from the crystal structure of PP1c in complex with a short, 13-residue peptide derived from a region of the PP1-glycogen targeting subunit (GM) responsible for PP1c interactions (Fig. 1A). This structure showed that the peptide associated with the phosphatase via two hydrophobic residues (Val and Phe), which engage a hydrophobic groove on the protein surface formed from the interface of the two P-sheets of the central P-sandwich and remote from the catalytic site . 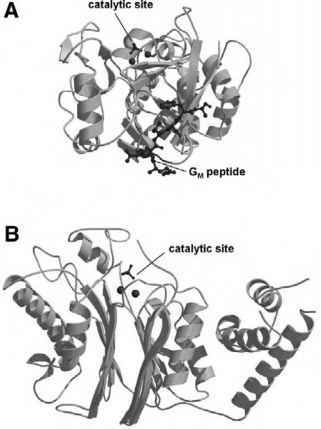 Two basic residues of the peptide immediately N-terminal to the Val residue form salt-bridge interactions with Asp and Glu residues at one end of the peptide binding channel. Alanine substitutions of either the Val or Phe residues of the peptide abolish PP1-peptide interactions. Analysis of other PP1-binding subunit sequences revealed the presence of the identical or related sequence motif RRVxF, found to mediate the interactions between the GM peptide and PP1c . The role of the degenerative RVxF motif in mediating PP1-regulatory subunit interactions is now supported by numerous experimental observations. First, for various regulatory subunits, mutation of either hydrophobic residue of the motif in native proteins weakens or eliminates their association with PP1c. Second, peptides corresponding to the RVxF motif competitively disrupt the interactions of regulatory subunits with PP1c. Third, the use of a common or overlapping PP1c binding site explains why the interactions of regulatory sub-units is mutually exclusive. The number of PP1 holoenzyme structures that could be generated in this manner is potentially infinite, and to date over a hundred PP1 regulatory subunits have been characterized. The residues of PP1 that interact with the RVxF peptide are conserved in all isoforms of PP1 in all eukaryotic species, although not within PP2A and PP2B, explaining why PP1-binding subunits are unique to PP1. The mechanism of combinatorial control of PP2A holoenzyme structure is different from that of PP1 and is mediated by a scaffolding subunit termed the PR65/A subunit, which simultaneously associates with the PP2A catalytic subunit and a variable regulatory B subunit. The ability to recognize a variety of regulatory sub-units (perhaps over 50) is conferred by the architecture of the PR65/A subunit, which consists of 15 tandem repeats of a 39-amino-acid sequence termed the HEAT motif and related in structure to ARM repeats. These repeats assemble to create an extended molecule ideally suited for mediating protein-protein interactions . Combinatorial generation of variable PP2A holoenzymes is achieved by the ability of different combinations of HEAT motifs to select different regulatory B subunits .
. The mechanism of inhibition of PP1 by okadaic acid and microcystin LR have been defined by structures of PP1 in complex with these inhibitors. Both inhibitors, although structurally different, bind to a similar region of the phos-phatase, occupying the catalytic channel to directly block phosphatase-substrate interactions. 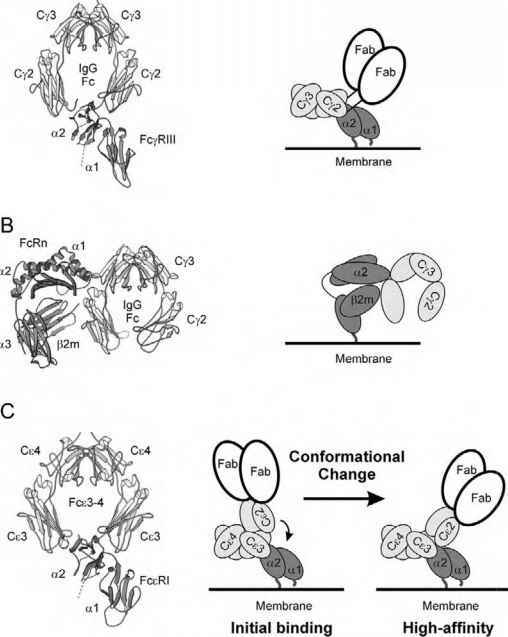 Regions of PP1 that contact the toxins include the hydrophobic groove and the P12/P13 loop, the latter undergoing conformational changes to optimize contacts with microcystin [2,3]. Both toxins disrupt substrate-phosphatase interactions by competing for sites on the protein that coordinate the phosphate group of the substrate. For example, carboxylate and carbonyl groups of microcystin interact with two of the metal-bound water molecules , whereas okadaic acid contacts the two phosphate-coordinating arginine residues (Arg-96 and Arg-221) . A similar mechanism of phosphatase inhibition by steric hindrance of substrate binding is observed in the structure of the full-length PP2B holoenzyme, for which the autoinhibitory domain lies over the substrate binding channel of the catalytic domain in such a way that a Glu side chain accepts a hydrogen bond from two of the metal-bound water molecules . Get All The Support And Guidance You Need To Be A Success At Dealing With Diabetes The Healthy Way. This Book Is One Of The Most Valuable Resources In The World When It Comes To Learning How Nutritional Supplements Can Control Sugar Levels.